Have you ever been to Napa Flats Wood-Fired Kitchen? It’s a small chain restaurant with locations in Austin, College Station, and Tulsa. I can only speak of the latter location. We love it. Not that there’s anything wrong with chain restaurants, but this location doesn’t feel like a chain. We generally are seated by one of the owners and the service is always spot-on. The food is hearty-homemade. The nightly specials are inventive and fun and delicious. 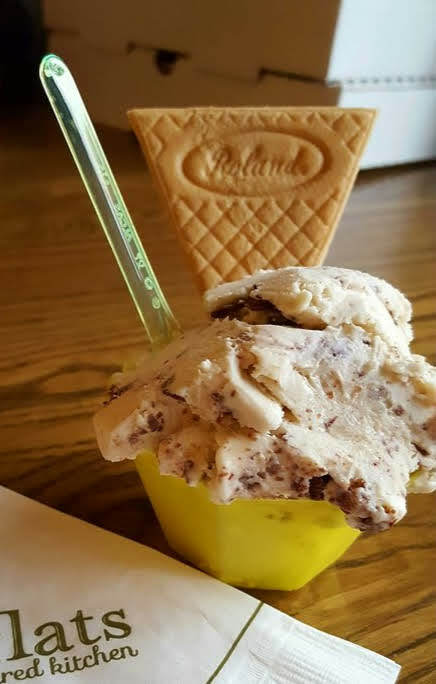 Did I mention gelato? You absolutely must try the Elvis —subtle banana flavor mixed with peanut butter and drizzled with chocolate. 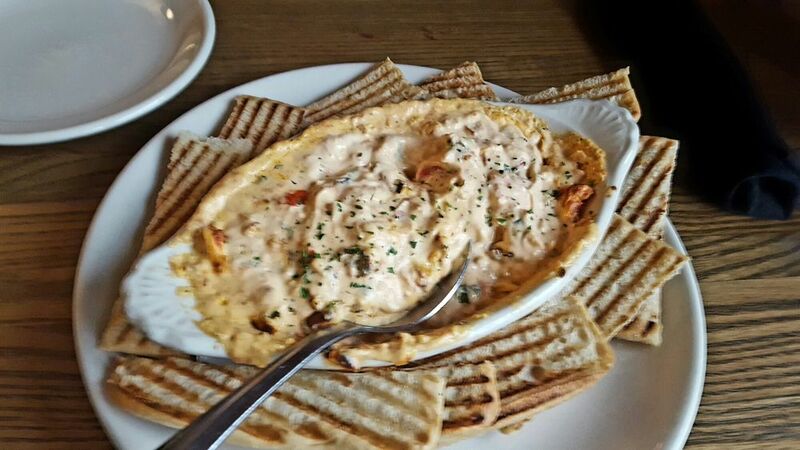 The start to any meal at Napa Flats has to included the Palo Alto Dip: Sun-dried tomatoes, artichokes, and green onions blended with ricotta and cream cheese. Served with Napa Flats bread. On a recent night out, The Hubs challenged me to recreate this appetizer at home. Here was my first go ’round. Mine is obviously a different color. 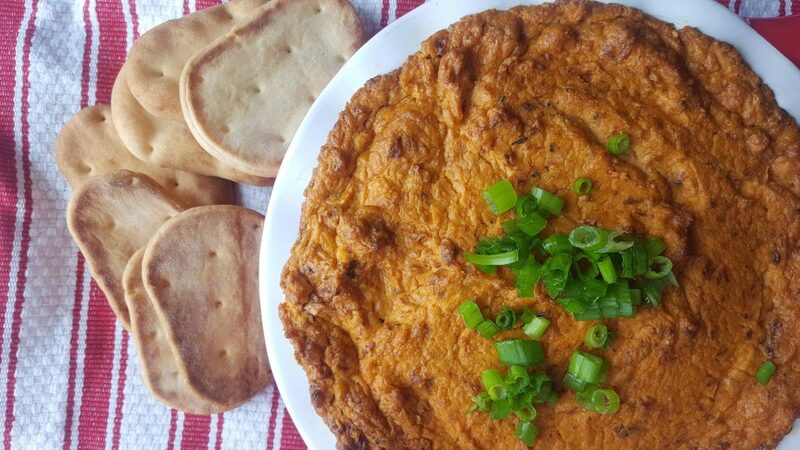 This recipe is an homage to one of our favorite appetizers from one of our favorite restaurants, Napa Flats Wood-Fired Kitchen. Clean and chop the green onions separating the white and the green parts. Heat olive oil in a small skillet. Saute the white parts of the onions until soft. (Set aside the chopped green tops for later.) Remove sauted onions to a plate to cool. Place the Ricotta and cream cheese in a bowl of a food processor. Pulse until smooth. Add garlic powder, dried rosemary, tomatoes and sauted green onions. Process to desired to consistency. Taste and season with salt and pepper. Spray a small oven-proof serving dish with cooking spray. Scrape the dip into prepared dish. Bake in preheated oven for 15-20 minutes or until warm and bubbly. Remove from oven. Let set five minutes before serving. Garnish with sliced green onion tops. Serve with crostini, crackers, and mini naan breads. Well, what did we think? I did leave out the artichokes from the original description of this dish. I honestly didn’t get a lot of artichoke flavor from the restaurant and I didn’t have any in the pantry. I ended up adding quite a bit more salt and pepper and threw in the rosemary for some more flavors. It’s close in flavor. It’s not close in color. 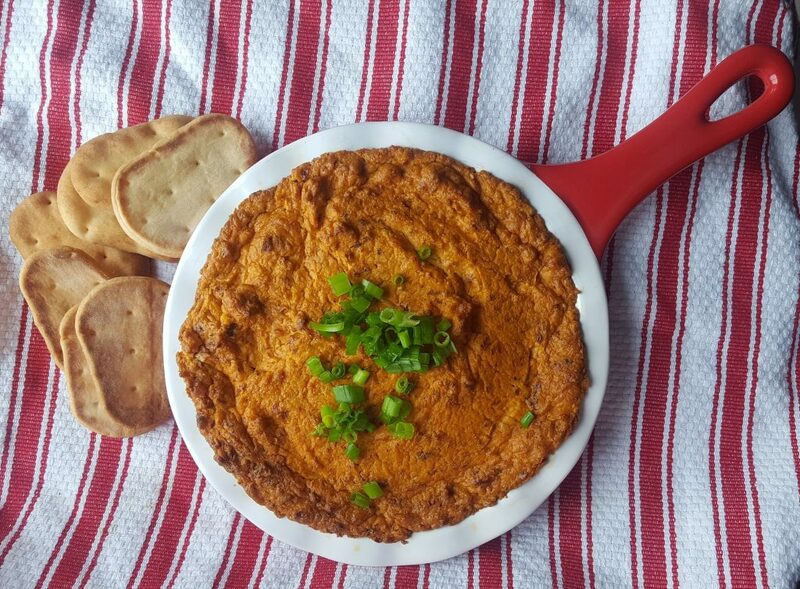 I’ve made this dip twice and took it to a recent cook-out. It was a hit there, too. For my Yelp review(s) of this little gem of a restaurant, see below. You must have known that I have a jar of sundried tomato that needs to be used up soon. The dip sounds really delicious. Hope you try this, Angie. I have dried tomatoes from the garden. They are not packed in oil. How do I adapt to use them?? I’d just add a bit of olive oil until you get the right dip consistency. Jarred tomatoes are a bit pricey so I’m going to try this mod, too. You have me hungry, once again! I could go for that gelato for dessert. Nice copy cat on the dip. It looks great. I could go for a gelato right about now as well. Thanks, Tina! Thank you. You can adjust the amount of tomatoes to fit one’s taste.